Prime Minister explains that Iran must be told that if it has 90% of the enriched uranium it needs for a nuclear bomb, it will be attacked. 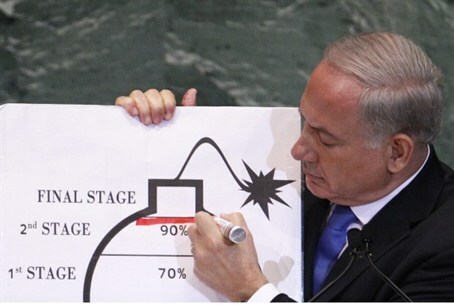 Prime Minister Binyamin Netanyahu drew an actual red line with a marker on a chart symbolizing Iran's uranium enrichment program, and expained that Iran must be told that if it reaches enough uranium enriched to the 90% level in order to make a nuclear bomb, it will be attacked. "3,000 years ago King David reigned over a Jewish state in our eternal capital of Jerusalem. The people of Israel live on. We say in Hebrew – Am Yisrael Chai. And the Jewish state will live forever," Netanyahu began his speech..
"The Jewish people have lived in the land of Israel for thousands of years. The masses of our people never gave up the dream of returning to our homeland. Defying the laws of history we did just that. "The Jewish people have come home. We will never be uprooted again. "Yesterday was Yom Kippur, the holiest day of the Jewish year. Every year for over three millennia, we have come together on this Day of Atonement. We remember the great travails of our dispersion. But at the end of Yom Kippur we celebrate the rebirth of Israel. We celebrate of the flourishing modern Jewish state. "The forces of Medievalism seek a world in which not life, but death is glorified. These forces clash throughout the globe, but nowhere more starkly than the Middle East. The Medieval forces of radical Islam whom you saw storming embassies in the Middle East – want to destroy freedom and end the modern world. "They are all rooted in the same bitter soil of intolerance. That intolerance is directed to their own fellow Muslims as well as Jews, Hindus and Christians, anyone who refuses to relent to their creed. I am sure that ultimately they will fail. The relevant question is not whether this fanaticism will be defeated, but how many lives will be lost before it's defeated." Netanyahu referred to the Nazi regime, and noted that the world took too long to wake up to its danger. "My friends, we cannot let that happen again. At stake is the future of Iran. Imagine the world with a nuclear armed Al Qaeda. "Given this record of Iranian aggression without nuclear weapons – just imagine Iranian aggression with nuclear weapons. Imagine their long range missiles tipped with nuclear warheads, their terror networks armed with atomic bombs. Who would be safe in the Middle East? Who would be safe in Europe? "Ladies and gentlemen, I've been speaking about the need to prevent Iran from developing nuclear weapons for over 15 years. I spoke about it when it was fashionable and when it wasn't fashionable. The hour is getting late. Very late. When it comes to the survival of my country, it is not only my right to speak – it is my duty to speak. And I believe that this is the duty of every responsible leader who wants to preserve world peace." Citing "the leadership of President Obama," Netanyahu noted that "For over seven years, the international community has placed sanctions on Iran. The Iranian economy has been hit hard. But we must face the truth. Sanctions have not stopped Iran's nuclear program either. "A clear red line must be placed on Iran's nuclear weapons program. Red lines prevent war. President Kennedy set a red line during the Cuban missile crisis. It is the failure to place a red line that leads to aggression. Earlier this year, Iran threatened to close the Straits of Hormuz. The United States drew a red line and Iran backed off. "To be credible, a red line must be drawn on Iran's efforts to enrich uranium," he said. Netanyahu explained that a nuclear detonator can be made in a small workshop. But for Iran, amassing enough enriched uranium requires thousands of centrifuges spinning in tandem – and this is done in large facilities that are vulnerable. Showing a diagram, Netanyahu explained: "Iran is well into the second stage and by next spring it will have moved on to the final stage. From then it's just a few months or weeks until they have enough uranium to build a nuclear bomb." He drew the red line at the 90% mark separating Stage 2 from Stage 3.